Roger Bowser is the manager of Energy Programs and Services at Midwest Energy Cooperative. He is as passionate about energy efficiency as he is about serving his 35,000 customers. [i] Sometimes, customers call with questions about high energy bills or need tips for reducing cold drafts in a house. Bowser always takes those questions seriously. Insulspan does too, knowing Insulspan SIP walls make a major impact on energy bills. With that level of commitment in mind, Bowser jumped at the opportunity for the public utility to join forces with the Lenawee Intermediate School District (LISD). The plan? 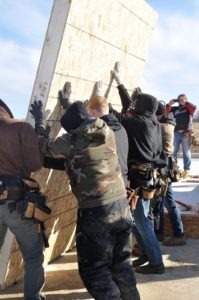 Build a home on the district’s Adrian, MI campus, working alongside groups of vocational high school students. …walls built with SIPs are energy efficient, durable, and sustainable. So, how did the project stay true to its mission of providing education about optimum energy efficiency? Bowser incorporated as many types of building technology as possible, looking for innovation, industry leadership, and, of course, local sources. First, innovation. SIPs, Bowser points out, are a product of advancements in building science. They are also “proof Insulspan’s engineers are paying attention and applying that knowledge.” Second, leadership. In Bowser’s view, this is secured by the fact that walls built with SIPs are energy efficient, durable, and sustainable. Faster to install, too. Students put up the SIP garage walls in considerably less time versus hand-framing. Students put up the SIP garage walls in considerably less time versus hand-framing. Finally, with another nod to sustainability, Bowser wanted the SEED house as ‘local’ as possible. Given that the SIP manufacturing facility is about 20 minutes away, “why wouldn’t we partner with an industry leader in our backyard?” The compelling benefits of SIPs were solidified after a day spent working with Insulspan because Insulspan showed the students “how to build it right – not just almost right,” says Bowser. Aaron Hinde, Insulspan sales manager, says continuously educating audiences about what the product does is essential. He says education includes more than reaching consumers and professionals walking through the SEED house. It also means reaching the students who built it. “Those students,” says Hinde, “are the future of the industry.” Finally– a future we can all get behind.